The winner of the International Jury Prize at the Cannes Film Festival, Die Leitze Bruecke (The Last Bridge) was the most financially successful postwar effort of its co-director, veteran German filmmaker Helmut Kauetner. 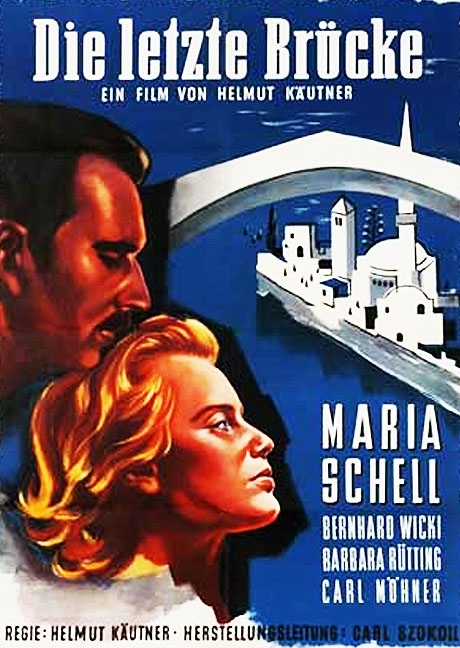 Filmed in a manner resembling Italian neorealism, the story concerns a German doctor, played by Maria Schell. While serving in WW II, Maria is captured by Yugoslavian partisans. Despite her distaste for her captors, she nonetheless tends to their wounded. As the film progresses, Maria realizes that people are people no matter what the color of their uniform. Like the film itself, Maria Schell won the Cannes Film Festival award; equally impressive is future director Bernhard Wicki as the partisan leader. What a movie. What a performance from Mariz Schell. This is a powerful anti-war movie from master director Helmut-"I can do anything"- Kautner.